The Arsenal boss claims the ex-Manchester United man was out of order. ARSENAL MANAGER ARSENE Wenger has launched a staunch defence of Mesut Ozil following criticism from former Manchester United midfielder Paul Scholes. Ozil moved to the Emirates Stadium in September 2013, but the World Cup winner has flattered to deceive at times, while injuries have also hindered his progress. Scholes, who won the Premier League on 11 occasions with United, stated that Ozil took the easy option when he left Real Madrid for Arsenal. 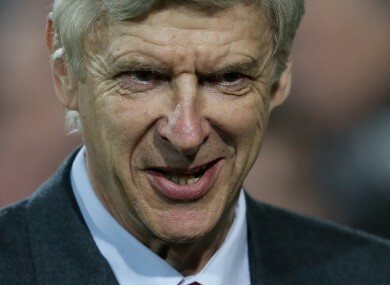 But Wenger has backed the job his record signing does for the team and believes his style of play masks his work rate. Speaking ahead of Arsenal’s FA Cup quarter-final meeting with United at Old Trafford on Monday, Wenger said ”I believe that what was said about Ozil was wrong. He works very hard and is a great player. “I think a player like Paul Scholes would have loved to have played with Mesut Ozil. “We are all in a job where we have to prove a point in every single game. I believe that he has the quality and puts in the effort to help the team. “He works much harder than his style shows. You can be cheated a little bit by his style of play because he is fluent, easy, supple, and he doesn’t look like he puts the effort in, but he does. Email “Arsene Wenger hits back at Paul Scholes' criticism”. Feedback on “Arsene Wenger hits back at Paul Scholes' criticism”.